We just found this really great kid’s face paint from Beetastic. This stuff is so much fun! You get an entire complete set with everything you need in one kit. The kit has eight different colors (every color you could need to make all kinds of designs), two sponges, 2 small wide applicator brushes, and a fine tip applicator brush. The paint is really high quality, it goes on smoothly and you only need one application. It looks great on the skin, very vibrant colors and even application. The brushes make application super easy and you get three different styles so you can apply the make up easily. This is great for just fun dress up play, events, Halloween, costumes, and much more. More Than 50 Faces in Each Face Paint Kit. This Water Based Kit Is FDA Approved, Non-Toxic, and Skin Friendly. Every Body Paint Color Is Smooth, Easy to Apply, and Washable. 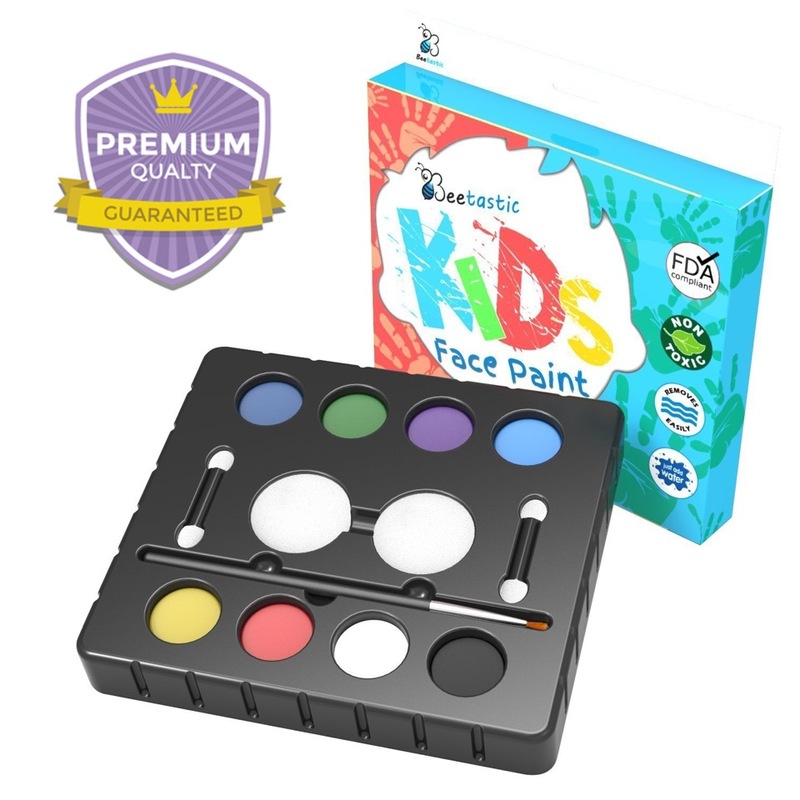 Each Face Painting Kit Includes: 8 Vivid Colors, 2 Double Sided Foam Applicators, 1 Paint Brush, and 2 Sponges. Frustration-less Shipping: Don’t Waste Money on Products That Ship with Cheap, Low Quality, Packaging – Where Paint Will Often Arrived Used, Opened, or Dried Out.